So, at first glance without even opening up, we can see a dirty disheveled bedroom, window showing a dark blue night sky, slat wall exposed in places, a dresser, laundry on the floor…ah, but what else, an open file upon a massively soiled mattress? What could this be about? Hmmm, well, ok, I picked it up and LO!, pleasantly surprised, the cover continues its sordid story around the back, pictures on the wall of bloody body parts, severed sections of…. is that a hack-saw there. and fire works out the other window, what does it all mean? Anything? This is all just from the cover! Diving into the story, we find a grotesque mystery of mutilation waiting for us…the story follows the steps of a deep cover operative who’s working a tricky case for the federal government. We soon find out more details. Bad part of town (which town?) Totally on his own during this investigation, the detective begins rattling off names and descriptions of places I either don’t know or don’t exist, and then, maybe they will be by 2004, which is where we launch off from. The singer’s name, which bothers me personally, and the cats’ song title ‘The Zann Variations’ (I’m guessing some sort of German Prog piece I wouldn’t want to hear… well perhaps with the right protection) it seems our detective is immersed in dangerous culture! Clearly, things for him are about to get worse and more complicated as he meets with his first major lead “Jonny C”. Nice outfit, Jonny. The story just keeps getting better and weirder, strange chants and coincidences abound! Will the detective figure it out? What reality are we involved in here? What’s going to happen next? I think by now if your not curious, you either hate my writing or don’t understand the few references to the story, and that’s ok! I don’t want to spoil all the surprises and treats that reveal themselves to the reader. So, To basically break down the working parts of THE COURTYARD, I must give credit to JACEN BURROWS, who’s art didn’t grab me till about page 14 or so but then seemed to totally morph inside of my mind creating a great moving art scape that kept me imagining more than I was seeing…good for you scoring this gig Jacen, I’m jealous…and can’t wait to see how you portray whatever else pops up. I’ll wait a bit on these fellows, because, what exactly is “sequential adaptation”, storyboards? thumbnails? Layouts? Late nights of “oh no, no, no, you got to put this picture here and this one ya cant show till later…”, for all I know, that’s probably part of the ‘creative directors’ job…here boys, smoke this, chew this, and drink plenty of water, but keep the recorder running at all times! Anyway you could go to the AVATAR COMICS website and do your own research, or just pop down to your local shop and ask for it (its probably up to number 3 by now). 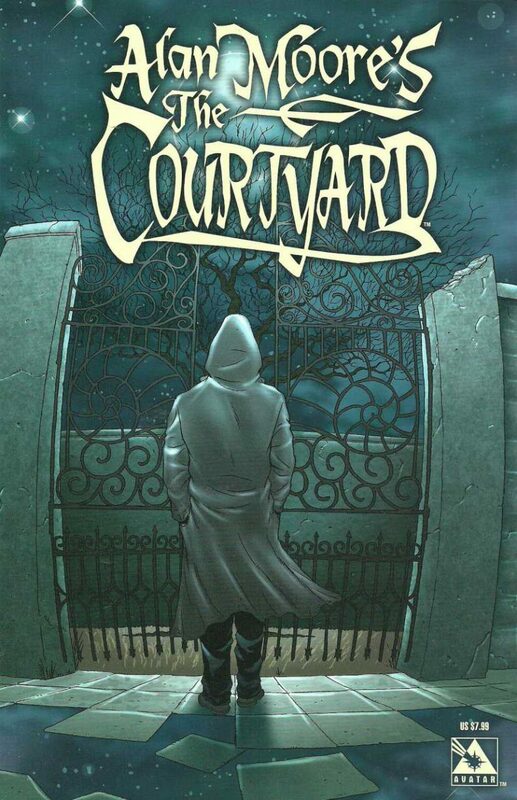 The COURTYARD promises to be and entertaining read, and that’s saying something these days, check it out.